Gurinder Chadha is one of the UK’s most proven and respected Film Director and Producers. Her award-winning films – Bend It Like Beckham; Bride and Prejudice; Angus Thongs and Perfect Snogging, and others – have earned over $300 million. Her latest film – Viceroy’s House, Starring Hugh Bonneville, Gillian Anderson, Huma Qureshi, Manish Dayak and Om Puri – releases worldwide on September 1, 2017. We had an opportunity to talk with Gurinder, where we discussed about what inspired her to make this film, what were the challenges and lessons of making this film. She shared her thoughts on Indian history, and her own history as a Kenyan-British-Indian. She also talked about diversity and inclusion in Hollywood and her own struggles, even today. And at the end gave some wonderful advice on how to support and promote diversity and inclusion. Viceroy's House is British-Indian historical drama film directed by Gurinder Chadha and written by Paul Mayeda Berges, Moira Buffini, and Chadha. The film stars Hugh Bonneville, Gillian Anderson, Manish Dayal, Huma Qureshi, and Michael Gambon. A chat w/ Anupam Kher - Acting, Hollywood & his 500th film "The Big Sick"
ANUPAM KHER is one of India’s most prominent actors. He has performed in over 100 plays and has been featured in over 500 films. Besides working in Hindi films, he has appeared in many acclaimed international films such as the Golden Globe® nominated Bend It Like Beckham, Ang Lee's Venice Film Fesitval’s Golden Lion-winning film Lust, Caution, and David O. Russell's Oscar®-winning Silver Linings Playbook. Art Shrian: Congratulations Anupam on the wonderful "The Big Sick". And thank you so much for taking the time to talk to us. Anupam Kher: Thank you so much! It’s wonderful to be here and be part of this film, it’s my 500 th film. AS: I was going to say that. 500th film! Congratulations! That’s mind blowing! AS: In your humongous career, you’ve played every kind of roles. And you’ve played lot of fathers too. So tell me what attracted you about this role personally? AK: I have done this film, to make a son’s wish come true. So there is no professional reason. Kumail’s father, when Kumail asked him, who do you want you to be played, and he said, Anupam Kher. And Kumail did not know how to get in touch with me. So, Kumail’s friend turned out to be my distant cousin Priyanka Mattu. So she called me by and she said, there is this actor called Kumail Nanjiani. I’ve not seen Silicon Valley and other things, so I didn't know about him. I was wondering, why does he want me? So she told me the story that his father wants you to play that role. So I said, okay, give me Kumail’s number. She said, no no, let it be professional, I mean, you don’t have to, let them reach out to you (laughs). So I dialed Kumail’s number, Kumail thought somebody was playing a prank with him that Anupam Kher was calling him up. But he said, I will call you back. And when he called me back, I said, “Look, do you want your father’s wish to come true? And I am the person who can make that wish come true. So, I am doing the film. AK: It was as simple as that. And I said, let’s work on the script later on, if I don’t like certain portion of the film, or if I don’t like the role, then we will work on it, but I don’t want to decide after I’ve read the script. I'll do it your film. So, that’s how it was decided. It had nothing to do with acting capabilities or the role, it’s done for emotional reasons. AS: Wow, that’s a wonderful story, thank you for sharing that. So did you make any suggestions or incorporate any changes to your role afterwards? AK: Well, in the first draft, everybody’s character were very well edged out and had all the details etc. But I thought, the father’s character was, father and mother’s characters were hurriedly written, it did not have that similar kind of weightage. Even though, film, does not require that. So we exchanged some mail, I gave him some ideas and they were generous enough to incorporate those suggestions and make them up with new scenes. So finally, I think, it turned out to be what it is. It was great, I think. They were all so open to suggestions at the time of the shoot, rehearsals, it was great. I think, a confident director always is open to suggestions. AS: I really like it, especially your role as well, the scene that really stood out, when he is leaving and you know, you come out with the mom-made things and you’re handing out and she’s seeing from the car. That particular scene really stood out, for me, because you bring in so much depth, there is not a lot of dialogue in there. But you’re feeling everything. You can feel the pain and pride that you feel in that moment for your son, which is amazing. You really make that wonderful. AK: And incidentally, that was the first scene we shot of mine, on the first day of shoot. So that scene was shot first. AS: (laughs) Oh wow! That’s how films work, alright. First is last and the last is first! You’ve done several International films all over. But it’s a very important film in America. This normalizes brown and muslim? A brown guy falls in love a white girl and what happens then. Yet It’s not about him being brown but just a love story. And it does that beautifully. It also brings in other aspects of, how the family gets impacted. So working on this project, what was your perspective? AK: I think, South Asian families mostly react in a certain manner. Its tradition, its certain way of life, etc. But one does not read a script from that point of view. Every film at the end of it is story-telling and then the other interpretations come in. If there is a cause, if there is that, you make a documentary about it. You don’t need feature film. As you can be making the most amazing film, but it does not have a soul or it does not have a story telling, it does not work. So, yes ofcourse, it [subject] was important. Also, I did not want to make it into a cliché kind of a thing. I didn’t want it to make a stereotype. So I liked that aspect of it. It did not have stereotyping. But yes, I personally feel that the most important thing in the world is compassion in today’s time. Compassion, togetherness, the language of love, so all these things are very important. But they cannot be told because you think that they must be told. They can only be incorporated if the work is, if the story is, interesting. So that’s what worked well in this film's favor. AS: It absolutely does work, you’re doing an amazing job. So, you have played a variety of characters that are so different from each other. From comedy, to villain, to character roles etc. Can you share where does that truth and honesty comes from. How do you make them all so real and believable. AK: I think, my brief to myself is all these people are real. All these people, their emotions, their ups and downs, their highs and lows, are real. They are people. And I have to make them as closer to reality or as real as I can. That’s what acting is all about. That people have to have livability. And I have not worked so much in terms before I got into movies, I am from drama school. And if I don’t do that, you will not ask me that question. So I do it for my own survival (laughs). I always wanted to be different. My job, is to sort of make it as closer to reality as possible. Of course, I’ve done comedy, and things like that. Yeah, even if it’s idiotic, all kinds of exaggeration, I do it with conviction. Because I love life. I enjoy being an actor and I enjoy being who I am. Also the other thing is, I run an acting school "Actor Prepares" in Mumbai for the last 14 years. My brief to actors is and to students is that, “You should be ready to make a complete fool of yourself. Then only you will be able to find the nuances of acting.” So, I don’t take myself seriously as a person or as an actor. So that makes my job easy and I am not scared of failure. It’s your fear of failure which makes you, sort of, be a little more careful in life, also in acting. That you want to be, you want to sort of make it, “Oh, it should work!”. But I also believe that when you are competent, you can never be brilliant. So, it’s okay to be bad, because no actor, writer, poet, artist has always given best work. He can only try it. So that’s what I did. AS: That’s so true, and I don’t think that there are many actors who can match that variety of the work that you have. So what about your favorite actors, like in India, or in Hollywood for that matter? AK: Performances are favorite. I have loved performances of various actors. My all time favorite is Brando, De Niro, Al Pacino. But that doesn’t mean that younger generation hasn’t done some amazing work, I think Bradley Cooper was superb in Silver Linings Playbook, you know. And Leonardo Dicaprio was superb in so many other films. AS: Last question Daniel Day Lewis, just announced that he is going to quit acting. You have done over 500 films already. Do you ever feel like that? Do you feel that I should quit? Or if not, why? AK: No, I respect Daniel’s decision, that’s how he wants to lead his life. I want to keep on working as long as I can. Its, I think, to me, work gives the best self-motivational things, I enjoy working. So, I will want to work as,till 90-95 whatever. AS: And we look forward to keep seeing you. So thank you so much for talking. Congratulation on your 500 films. AK: Thank you Art Shrian. SYNOPSIS: Based on the real-life courtship between Kumail Nanjiani and Emily V. Gordon, THE BIG SICK tells the story of Pakistan-born aspiring comedian Kumail (Nanjiani), who connects with grad student Emily (Kazan) after one of his standup sets. However, what they thought would be just a one-night stand blossoms into the real thing, which complicates the life that is expected of Kumail by his traditional Muslim parents. When Emily is beset with a mystery illness, it forces Kumail to navigate the medical crisis with her parents, Beth and Terry (Hunter and Romano) who he's never met, while dealing with the emotional tug-of-war between his family and his heart. THE BIG SICK is directed by Michael Showalter (Hello My Name Is Doris), written by Emily V. Gordon & Kumail Nanjiani, and produced by Judd Apatow (Trainwreck, This Is 40) and Barry Mendel (Trainwreck, The Royal Tenenbaums). 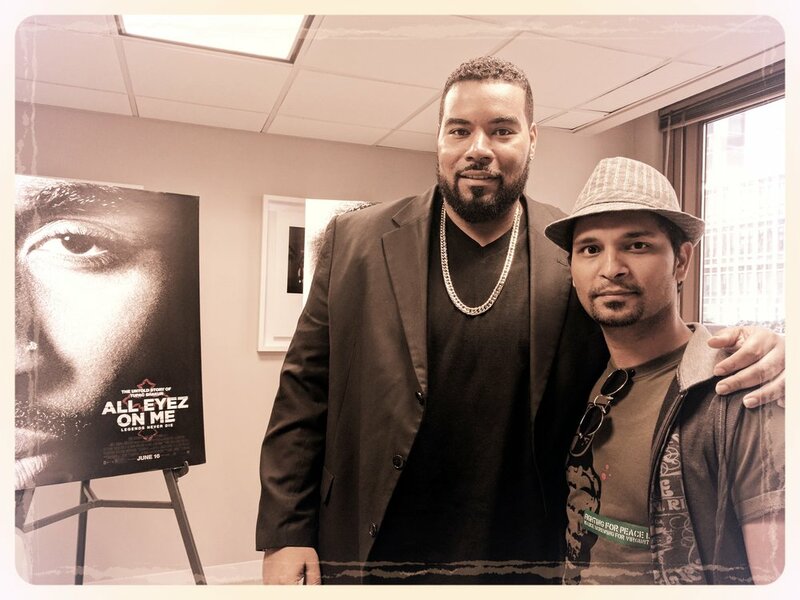 Dominic Santana, a STAR in making, on his BIG BREAK as Suge Knight in "All Eyez On Me"
Dominic Santana is one of those actors that have the talent, the brains and the heart to be great. A hard working actor, who started his journey doing background work 10 years ago, and then moved on to TV roles and independent films. He gets his first real BIG BREAK in "All Eyez On Me", playing the real life character of Suge Knight, Tupac's parter, producer and friend, who was the co-founder & CEO of Death Row records. And he brings it ON. He's charming, he's fierce, he's loyal, he's a gangster, he's a businessman, he's lil crazy, and he's cool. I'm talking about Dominic's Suge Knight, in the movie. Dominic gives a strong and wonderful performance in the movie, that calls for his own spin off for a Suge Knight/Death Row Records Movie. About Dominic Santana: Dominic Santana was born in Fayetteville, NC to an Army Officer Father and popular singer/writer Mother, Tracey Santana. Upon moving to Wilmington, NC he began to seek out information on the local film scene and met Sam-Art Williams (Producer, "Martin"). Dominic began working as an extra on films such as "Black Knight" starring Martin Lawrence and hit shows like the WB's "Dawson's Creek" where he landed his first speaking role on a major television show. A last minute script change called for a tall actor on the spot. After, a Fincannon & Associates casting staffer suggested Dominic; he auditioned right on set and was given the role. Dominic was called by longtime friend Micah Noble to audition at Screen Gems Studio for then newly started Swirl Films and within twenty minutes he was cast in their first production "20 Funerals”. Although, it was a small role Santana delivered such a strong performance he was cast as the lead in "Dead Heist" in 2006. Then again, opposite Tom Sizemore and Ja Rule in "Furnace" in 2007. After, booking a role on several episodes of the CW hit series "One Tree Hill" he was again brought in to co-star in what would be a cult hit and most played movie ever on BET, "Love For Sale" which premiered to over ten million viewers and quickly became a fan favorite! Santana has also appeared in shows and films such as "Whitaker Bay", "Palmetto Pointe", "Little Britain USA", BET's "The Game", Bolden!, "The Dempsey Sisters" and more. Currently, Dominic is co-starring in the Tupac biopic "All Eyez On Me" as Suge Knight. The Morgan Creek film will be released nationwide through Lionsgate June 16th. Worldwide release to be announced. Synopsis: "ALL EYEZ ON ME tells the true and untold story of prolific rapper, actor, poet and activist Tupac Shakur. The film follows Shakur from his early days in New York City to his evolution into being one of the world’s most recognized and influential voices before his untimely death at the age of 25. Against all odds, Shakur’s raw talent, powerful lyrics and revolutionary mind-set propelled him into becoming a cultural icon whose legacy continues to grow long after his passing.